Purchase the Despicable Me (Minion Madness DVD Double Pack + Digital Copy) | Despicable Me (Four-Disc Combo: Blu-ray 3D / Blu-ray / DVD / Digital Copy) now! Now your little minions can enjoy the hottest animated film of the year, while wearing the hottest tend of the year! Purchase any Despicable Me DVD and receive a pack of Despicable Me Character Bandz free! Each pack contains 12 Despicable Me bandz in the shape of Gru, Agnes and the lovable minions in four fun colors! “**** This Year’s COOLEST Animated Comedy!” – Jeff Craig, Sixty Second Preview Get ready for a minion laughs in the funniest blockbuster hit of the year! Vying for the title of “World’s Greatest Villain”, Gru (voiced by Steve Carell) – along with his hilarious crew of mischievous minions – plots to pull off the craziest crime of the century: steal the moon! But when Gru enlists the help of three little girls, they see something in him nobody else has ever seen: the perfect dad. From executive producer Chris Meledandri (Horton Hears a Who, Ice Age 3), and featuring the voices of an all-star comedic cast, including Jason Segel, Russell Brand, Miranda Cosgrove and Julie Andrews, Despicable Me is “rousingly funny, heartfelt and imaginative” (Pete Hammond, Boxoffice Magazine). 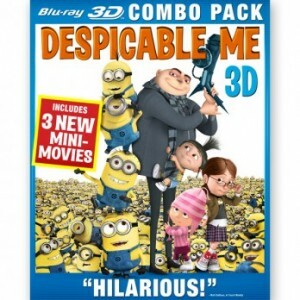 Enter to win a FREE copy of “Despicable Me” on DVD! In order to enter the contest, become a fan of ReviewSTL on Facebook and suggest ReviewSTL.com to all your friends (click the “suggest to friends” link on the left side of the page). Then post a comment on the ReviewSTL fan page telling us why you want to own this movie! NO PURCHASE NECESSARY. PLEASE REMEMBER TO READ THE RULES! “Despicable Me” is available now on Blu-ray / DVD!